Pictures of class warfare continue to flash across Turkish television screens as workers for the formerly state-owned tobacco monopoly Tekel carry on their protest against the state's closure of 12 factories and plans for their re-assignment as temporary workers (4C employment status). Under the government's plans, laid off Tekel workers would be redeployed into lower-paying temporary personnel positions in other private firms for a period of ten months. Under the plans, Tekel workers would receive no severance and be faced with unemployment following the ten months. Further, they would lose their rights to strike and collectively bargain since they would no longer be working as public workers under the Labor Law. Protests have been marked by violent street clashes with police, a seige of AKP party headquarters, and now, a hunger strike that has left at least nine protestors hospitalized. 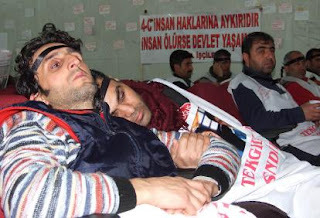 After AKP efforts to resolve the conflict by meeting with labor union representatives failed, the Confederation of Turkish Labor Unions (Turk-Is), the main umbrella labor union here, executed a general strike in which thousands of workers across Turkey did not report to work in order to show solidarity for Tekel workers. The Labor Confederation (Hak-Is), the Confederation of Revolutionary Workers’ Unions (DISK), the Confederation of Public Sector Trade Unions (KESK), and the Turkish Public Workers’ Labor Union (Kamu-Sen) all participated in the strike. In a February 1 meeting with union leaders, the government had offered the workers an additional month of work, as well as severance pay and 22 days paid leave. Turk-Is, along with the other five unions, are now calling for another meeting with Prime Minister Erdogan and Parliamnet Speaker Mehmet Ali Sahin. The unions are planning to meet Friday to decide their next move. Turkey has historically had a very large state sector, of which Tekel is a legacy. The question of what to do with laid off workers cast out of their jobs after sometimes decades of employment is particularly difficult, and indubitably irksome to the AKP, which has shown itself eager to privatize public sector firms, boost foreign direct investment, and solidify Turkey's re-orientation as a liberal market economy based on free trade principles and a diminished public sector. While the AKP has promoted welfare policies, its emphasis has been on strengthening Turkey's largely traditional welfare regime, moving responsibilities for caring for the least vulnerable members of Turkish society out of the state's hands and into those of voluntary and philanthropic organizations, with which the Islamic-oriented party has plenty of connections. UPDATE I (2/21) -- An estimated 20,000 people assembled in Ankara on Sat., Feb. 22, to march in support of Tekel workers. AFP reports that Prime Minister Erdogan has "given the workers until the end of the month to either accept the new status or face unemployment, threatening to send police to demolish their make-shift tent city in the heart of Ankara." UPDATE II (2/24) -- Tekel workers are planning another demonstration for tomorrow and a sit-in for Saturday following resignation of their principal union leader following a meeting on Monday between Turk Is, DISK, KESK, and Kamu-Sen, folloing which the four unions said they would end resistance if Tekel workers decide to do so. The four unions are characterizing the demonstrations as successful, though they have said they will support Tekel workers in their final decision. This organizational rift occurs as the end-of-the-month deadline approaches.